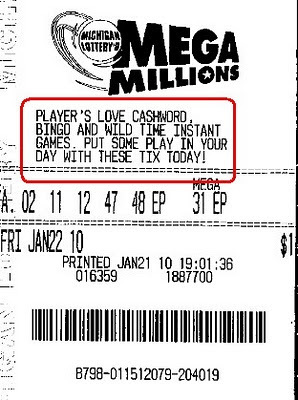 Not only is this lottery ticket a loser, but it contains an apostrophe catastrophe! Players contains an errant apostrophe. Better luck next time, Jerome, and thanks for sending in this catastrophe. Maybe the Michigan lottery will pay you to be a proofreader instead. I have not seen "tix" as an abbreviation for "tickets". Not here in the UK anyway. Boy! I just love lotteries. I have been earning my bread and butter with whatever little amount I won in lotteries. Although mostly I lost, I got a few jackpots too. That was kept my love for lotteries alive. It is great way to earn easy money.